Screen grab from Lockheed's Q2 earnings statemen; we have highlighted (in red) the company's cash position and how it was used. PARIS --- The $1 billion that the Pentagon recently paid to ease Lockheed Martin’s cash-flow on the F-35 program’s LRIP Lot 9 contract allowed the company to “return $1.0 billion to stockholders,” according to Lockheed’s July 19 second quarter earnings statement. Lockheed has long complained that the delay in signing the Lot 9 contract is harming its cash flow by forcing it to advance cash payments to its suppliers, even though the contract has not been signed through its own fault: its asking price is too high for the Pentagon. “The Corporation may determine to fund customer programs itself pending government appropriations. If the Corporation incurs costs in excess of funds obligated on a contract, it may be at risk for reimbursement of the excess costs. In 2014 and 2015, the Corporation received customer authorization and initial funding to begin producing F-35 aircraft to be acquired under low-rate initial production (LRIP) 9 and 10 contracts, respectively. The Corporation continues to negotiate these contracts with its customer. “Throughout the negotiation process, the Corporation has incurred costs in excess of funds obligated and has provided multiple notifications to its customer that current funding is insufficient to cover the production process. “Despite not yet receiving additional funding, the Corporation continued work in an effort to meet the customer’s desired aircraft delivery dates. “As a result, as of June 26, 2016, the Corporation has approximately $900 million of potential cash exposure and $3.0 billion in termination liability exposure related to the F-35 LRIP 9 and 10 contracts. Yet the Pentagon authorized a $1 billion cash payment to Lockheed in early August, Defense News reported August 12, five months earlier than Lockheed expected and for $100 million more than Lockheed’s claimed shortfall. Furthermore, the payment – reportedly made under an existing undefinitized contract action (UCA), has not been made public. Joe DellaVedova, spokesman for the F-35 Joint Program Office (JPO), told Defense News that “with what we have provided, Lockheed will be able to continue the LRIP 9 production without bearing any undue burden,” as if managing contractor cash flow was a government responsibility. DellaVedova did not reply to an Aug 15 e-mail asking for clarification. The cash payment to Lockheed is all the more surprising that the company does not appear to have any cash-flow problems, and indeed continues to generate substantial cash. For the first half of the year, Lockheed posted an operating profit of $2.86 billion, dwarfing its claimed $900 million shortfall on the F-35. Lockheed also said it “generated cash from operations of $1.5 billion,” so it was hardly pinched for cash, especially as its F-35 sales increased -- during just the second quarter -- by $390 million, and its operating profit by $60 million. Second quarter “operating profit increased approximately $60 million for the F-35 program due to increased volume and sustainment activities and higher risk retirements,” which seems to contradict the claims made about the cash shortfall. 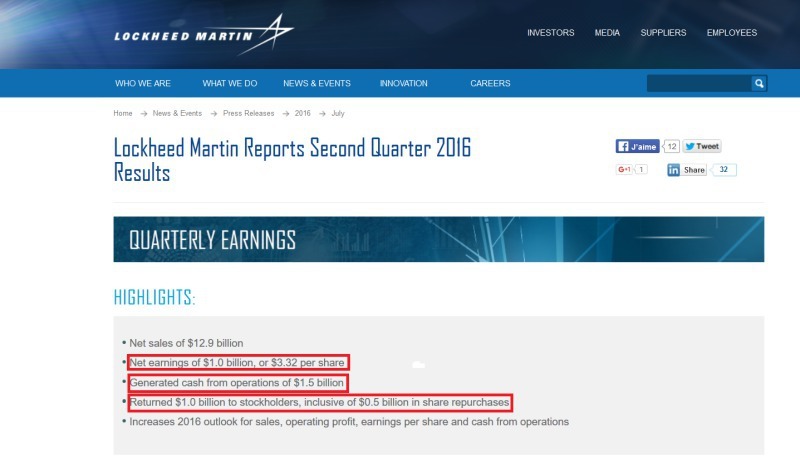 Interestingly, while complaining it faced a $1 billion cash shortfall from the F-35 program, Lockheed was able to announce it had “returned $1.0 billion to stockholders” – the same amount as the cash advance it received from the JPO. Lockheed it returned the cash to stockholders by “repurchasing 2.1 million shares for $501 million” and “paying cash dividends of $501 million. It is not immediately clear why managing the cash-flow of a private contractor is the responsibility of a government agency, so it will be interesting to see the official explanation once it is supplied. - Rewrote several paragraphs for clarity, corrected syntax error in final paragraph and added caption.